FONRWA office-bearers had a very fruitful meeting with Shri Rajesh Prakash, Addl.Chief Executive Officer, Noida Authority; Shri A,K. Goel, CE and Shri Ved Pal,PE(RWA) were also present. 1. 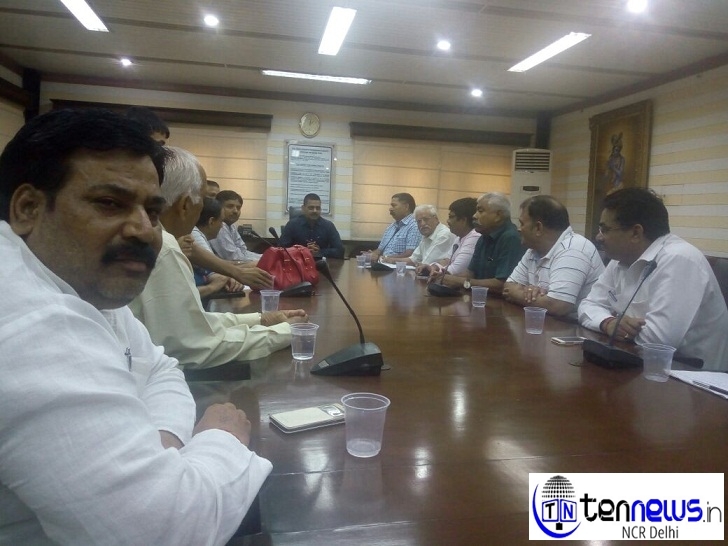 At the outset, it was stressed by Shri N. P. Singh, President, and other office-bearers of FONRWA that FONRWA and RWAs are not having the desired response from Noida Authority to the issues raised by them. The Secretary General, Shri A.N.Dhawan, argued that even the minutes of the meeting held and/or action taken reports are not being made available. At this, copies of the minutes of the last meeting taken by the ACEO, on 3.6.2016, were made available. 2. A representation containing only 5 key and critical issues, namely, (i) construction of boundary walls around the sectors; (ii) drive for cleaning of NALAs and storm water drains; (iii)JAL & Sewage problems (iv) timely repair of streetlights; and (v) menace of stray dogs, , was presented, a copy of which is attached herewith. 3. At the outset, the ACEO reiterated that as suggested by him at the meeting taken by him on 3.6.2016, RWAs may hold meetings with PEs and other officials of five departments, namely, works (civil), health, horticulture, electrical and Jal/Sewage. For this purpose each RWA should hold meetings turn by turn. The ACEO asked FONRWA to draw up a roster Work-circle wise and submit to him and he will issue the same for strict compliance. FONRWA President and Secretary General promised to draw up the same and hand it over to him in a day or two. It was agreed that the proposed meetings shall be held daily at 5.00 p.m. on Monday to Saturday. 4. Reg. the issues relating to desilting of NALAs, sewage, drinking water etc the ACEO said that the work is in progress which shall be accelerated and hopefully, the same may be completed in about a fortnight’ time. 5. Reg. construction of boundary walls in the Sectors, the ACEO asked FONRWA to draw up a list of the requisite locations in the Sectors and provide to him and necessary steps will be taken to do the needful. FONRWA shall be ascertaining details from Member RWAs.and submit the list to the ACEO.